What hearing checks do young children need? Find a Well Child Tamariki Ora provider. Your child's hearing is screened as part of the B4 School Check. This is usually done by vision and hearing technicians. 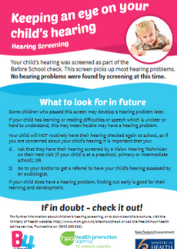 If your child doesn't have their hearing screened at 4 years of age, it's important they have this screening done in their first year at school. This screening picks up most hearing problems. If your child missed their screening, contact your child's school to make sure the vision hearing technician screens your child on their next visit. Will my child have another hearing check when they are older? After your child has their hearing checked at 4 or 5 years of age, they will not have their hearing checked again at school, so if you are concerned about your child's hearing, it's important that you visit your family doctor. Your doctor may refer your child to the hospital for an assessment by a hearing specialist (audiologist). If your child does have a hearing problem, finding out early is good for their learning and development. What vision checks do young children need? Your child will be screened for lazy eye (amblyopia) as part of the B4 School Check. This is usually done by vision and hearing technicians. See common eye problems in children. 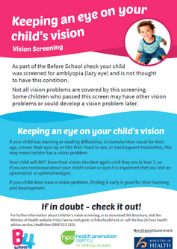 Children who have their vision screened as part of the B4 School Check either ‘pass' the screen or are ‘referred' for a full assessment. The results of this screening will be sent to you in the mail or will come home with your child. The results will explain how you can have your child further assessed if needed. What if my child passes their vision screening? Remember that not all vision problems are covered by this screening. Some children who passed this screen may have other vision problems or could develop a vision problem later. See common eye problems in children. What if my child is referred for a full assessment? What if my child doesn't have their vision screened at 4? If your child doesn't have their vision screened for lazy eye (amblyopia) at 4 years of age, it's important they have this screening done in their first year at school. This screening does not find all vision problems. See common eye problems in children. What if I have questions about my child's vision screening? 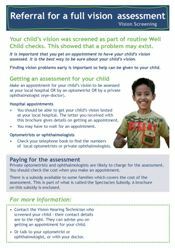 If you have questions about your child's vision screening, call the Ministry of Health's free 24-hour health advice service, Healthline (0800 611 116) or talk to the vision hearing technician who screened your child, an optometrist, ophthalmologist or your family doctor.